With the fifth generation Camaro nearly ready for public consumption, the Chevrolet public relations staff was pondering a unique way to get the word out about the latest version of this iconic muscle car. Someone came up with the bright idea of getting automotive journalists to drive the car to all of the 48 contiguous states and tell their readers, listeners and viewers about the all new sports coupe. My friend and frequent driving partner for new car introductions, Arv Voss, suggested we drive together on the first leg of what Chevrolet billed as the “Finding New Roads” Trip. Arriving in Detroit the evening before the start, we had a brief introduction to the program, a presentation by President of Global Chevrolet, Alan Batey, and had a chance to check out our transportation for the program, the 2016 Chevrolet Camaro. After a good night’s sleep, a quick breakfast and a little more detail about the drive we were ready to go, with the last task being the official ‘Drawing of the Keys’. This was Chevrolet’s attempt to make the car assignment process the fairest. I drew a “Black 1SS Manual” for our drive, which we were pleased to discover was a sinister-looking all-black Camaro SS with a touch of red trim accenting upper levels of the car’s fender line and massive 20-inch black wheels with a red highlight stripe just inside the edge of the wheel. The tires on our car were the high performance Eagle F1 Asymmetric 3 run-flat tires. The downside of these tires is they are noisy; the upside is excellent traction and handling. The trunk in the new Camaro holds 9.1 cubic feet of luggage, which was plenty for our bags, plus we had the back seat for any extras. Arv plugged in his trusty radar detector, not that we’d need it, and we were ready to go. The car is a real head-turner to look at and drew even more attention from the deep throated quad outlets which pumped out the exhaust notes from the 6.2-liter 455-hp V-8 under the hood. Our car was also equipped with the six-speed manual transmission, and everyone knows we auto writers always prefer a manual transmission. 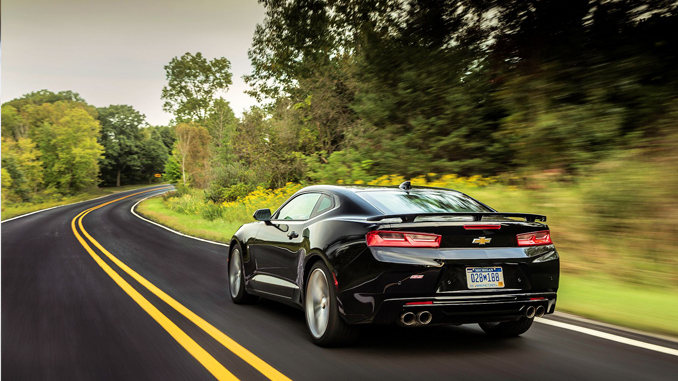 While that’s always the fun choice, both Arv and I admit privately we would have preferred the available new Camaro eight-speed automatic transmission, which can be ordered with any of the three available new engines, and it shifts faster than we can.